About - Guidry Custom Homes, Inc. In business since1987, Guidry Custom Homes is a local home builder with a reputation for building elegant custom homes of exceptional quality and style. We specialize in a holistic design/build process that balances client needs and desires with client budget. With a focus on making the home building experience both pleasant and rewarding, we take pride in guiding clients through the home building process from start to finish. Guidry Custom Homes, Inc. is a licensed and insured Louisiana Residential Building Contractor (license # 88289). We’re active in the Home Builders Association of Greater New Orleans and the Louisiana Home Builders Association, holding the position of director in both organizations. 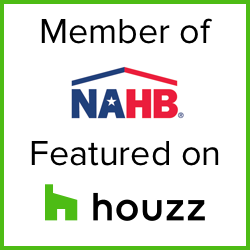 We’re also a member of the National Association of Home Builders and the Better Business Bureau.